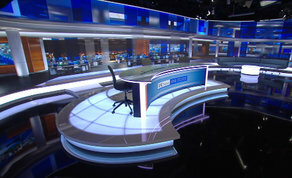 The brand new look for RTÉ News was unveiled on Monday night’s Six One News after a major refurbishment and technical upgrade was made to the RTÉ News studio. Studio 3 is the busiest television studio in Ireland, broadcasting over 1,700 news bulletins and programmes each year. This is the first refurbishment of the busy studio in ten years and it will enhance RTÉ's storytelling capabilities as it reports on Ireland and the wider world. The upgraded studio features a new video wall, 24m long and 3m high, spanning three sides of the studio. It utilises LED technology and a lighting system which is 70% more energy efficient. The refurbishment has seen the introduction of new automated HD cameras, a new set design, additional presentation areas and changed opening graphics for the main news bulletins. The replacement of the old video wall has increased studio floor space by 25%. The work on Studio 3 cost €1.4 million and was financed as major capital investment project by RTÉ directly from the proceeds of RTÉ's land sale. The last major renovation was ten years ago in 2009 at a cost of 1.3 million and during its life span was used to broadcast over 15,000 programmes. The new look RTÉ News also sees a reworking of the familiar RTÉ News theme music by Irish composer Ronan Hardiman and recorded by the RTÉ National Symphony Orchestra. RTÉ's main news studio is home to the Six One News, Nine O'Clock News, One O'Clock News, News with Signing, news2day for young people, The Week in Politics, Leaders Questions, Breaking News Specials, Budget coverage, Referendum results coverage, and other special events live programme coverage such as national commemorations. The new studio made its first offcial broadcast live on Monday, January 28th.